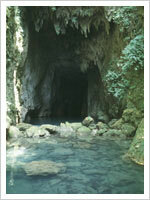 The main entrance of this famous cave is located at the bottom of the western flank of Lum Lawbah.The entrance is easily found by following the river behind the cement works of the Mawmluh Cherra Cements Limited, downstream for about 200 metres to a point where the river disappears underground.The main sink entrance requires wading through water, which in the dry season turns into a deadly black quicksand from the effluents of the cements works. The best option to enter the cave would be through a high level bypass entrance which runs parallel to the main passage. The impressive entrance of Krem Dam, measuring some 30 m across, lies at the foot of a large blind valley approximately 1 km to the east of Mawsynram village. A sizeable stream running down the valley enters the cave. The cave is formed in a coarse grained facies of limestone which almost looks like sandstone. The cave consists mainly of one very large river passage ending in a roof collapse where daylight can be seen. To the side of the main passage a complex maze of side passages and oxbows exist. The cave has no significant calcite formations. The cave lies about 6 km. from the village of Nongjri. The inconspicuous entrance hidden in the jungle covered boulders reveals itself by the cool air it blows. It is another beautiful and rather easy cave for any tourist.From the small entrance hole, the main trunk passage runs for about 1 km with inclined walls and ceiling towards west into a passage known as ‘Way to Heaven,” which is a very loose and slippery climb. 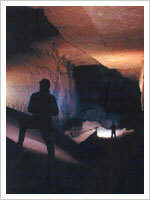 It leads into a series of spacious galleries which are very rich in calcite formations. Here, the great attraction is the Mughal Room (more than 25 m wide, 25 m high, and 75 m long). This cave is 6641m in length. 6 kms from the Sohra market to the south lies the village of Mawsmai in the di­rection of Bangladesh border. At the village crossing, one passes grasslands surrounded by for­ests, ending in a clearing. From this clearing, a concrete pathway through the jungle leads up to the main cave entrance. This cave is the only cave that is fully lighted. The cave can be divided into two parts (old and new). 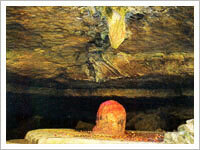 Of the two, the new cave is yet to be lighted. 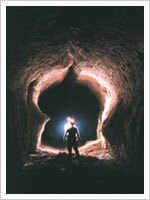 It has impressive formations of large passages and chambers. Half a kilometre before reaching Mawsynram village, a metalled road on the left leads to a parking area by the cave.The entrance chamber of some 50 metres across and 4 metres high at its centre, has a large stalactite over a female stalagmite which gives an impression of a Shiva Lingam. This cave has now become a sacred shrine for Hindu believers.A small stream flows under the left (east) wall of the chamber, around some large boulders before entering a side passage heading east which runs for about 40 m to end in a boulder collapse. A side passage leads to a second rift entrance, called Back Entrance which exits out through the rear. Another side passage at the rear of the chamber forms a series of small rift inlet passages that run north and then east for some 50 metres, before becoming too tight.The cave is formed in calcareous sandstone and is only 209 metres in height. 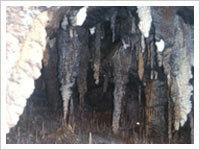 It is the longest natural cave in India. Liat Prah is one of approximately 150 known caves in the Shnongrim Ridge of the Jaintia Hills district in the state of Meghalaya, northeast India. Explored and surveyed as part of the ongoing Abode of the Clouds Expedition project, its current length of about 25 kilometers will likely be increased as nearby caves continue to be connected. Liat Prah’s dominant feature is its enormous trunk passage, the Aircraft Hangar. The cave entrance is situated north of the track from Chiehruphi village, on NH 44, to Musianglamare.With 14,157 m of surveyed passage, it is currently India’s 3rd longest cave.The wet crawl entrance passage leads to about 500 m of very awkward boulder strewn passage which is followed by one of the world’s finest cave passages. 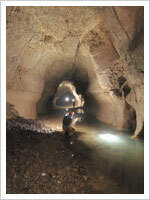 This 7.63kmlong meandering stream-way (Wah Lariang), is probably one of the world’s longest single cave passage. The cave is very rich in formations coloured in orange, red, black, grey, blue, green and white.‘Titanic Hall’ chamber would rank as one of the most beautifully decorated chambers anywhere in the world with ‘ thousands of large cave-pearls lying scattered on the floor.The cave has five entrances with the other four being Krem Musmari, Thloolong Cherlamet, Krem Eit Hati and Krem Khlieh Trai Lum. In the Sutnga/Sakhain area (near N25°1708′; E92°2731), situated at the foot of a 30m high waterfall is a resurgence cave Krem Lubon, with an impressive rectangular entrance measuring 16 m wide and 8 m high. The cave entrance hidden behind the waterfall is reminiscent of the legendary ‘Phantom Cave’.The large passage gradually deteriorates in size to pass high level breakdown chambers characterized by unstable boulders before it continues into a wet flat-out crawl. 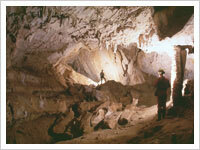 The cave is 687 m in length. It is a resurgence cave, situated at a walking distance of about 3 km approximately north along the track from the village of Khaddum to Sielkan.It is a magnificent river cave which would require over 3.5 km of swimming over a series of very large and deep lakes, formed by the existence of more than 50 natural dams or gours, 6 to 8 m high. The cave has a very large colony of bats and possibly cave-adapted fish.With 10.5 km of surveyed length it is currently India’s 5th longest cave. 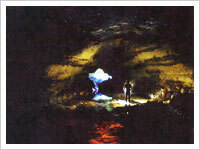 The cave has several leads yet to be explored. 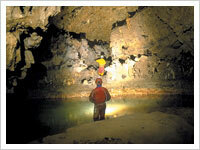 Sielkan Pouk which is at the upper reaches, acts as a sink to the cave system. The entrance of Krem Kotsati is located in the centre of Lumshnong village itself. It is used as a washing place by the villagers. One needs to swim to enter the cave. During the monsoons the entrance is submerged. 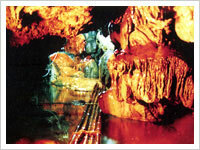 Kotsati-Umlawan Cave system is a network of many caves like Krem Kotsati, Krem Umtyongai, Krem Umsynrang Liehwait, Krem Wahjajew. Krem Lalit, Synrang Thloo, Krem “Washing Place Inlet,” Krem Umshor, Put Lyer,Garage Pot, Thloolong Kharasniang and the thirteen other entrance of Krem Umlawan. With 24 entrances, both horizontal and vertical, no part of the cave is more than one hour away from the nearest entrance. The beautiful cave entrance, used as a washing place by the local people, is situated behind the sawmill to the south of the Lumshnong Petrol Station. It is a splendid river cave with lots of formations, and mostly low but wide, wet and crawling size bedding plane passages. 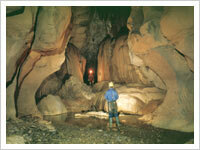 Length :1268 m.
The cave is accessible from the village of Tangnub and lies at the end of a fluted canyon. This excellent system begins with a massive vertical entrance shaft of 97 m deep which descends into a fine stream-way accompanied by a maze of high fossil passages. 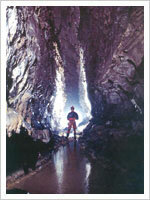 The cave measures 20 m by 40 m at the surface and opens to 60 m by 60 m at its base. The cave also has marvellous key-hole passages, coated with orange mud. It has just one entrance which requires prusiking on the way out.It is presently the deepest direct shaft known in India and with a surveyed length of 8862 m. It is currently India’s 5th longest cave. The cave lies about 680 m in a direct line east of the church at Lelad but 100 m lower. 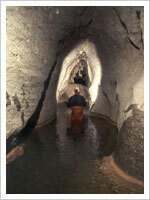 It is a dendritic master river cave that acts as a collector for several inlets and drains the area east of the village Lelad. The uninviting entrance, in between boulders, opens to a 5 m pot that drops into a fine, clean-washed stream passage, which again leads to a 24 m deep pitch. The stream passage gets larger, both upstream and downstream, with the downstream passage measuring 12 m by 10 m. The cave has several very well decorated high level passages.It is a beautiful cave system of 3339 m in length. An obvious track down the slope from the village to a point where it steepens and immediately below this, a small path heads off through the forest to the left for some 50 m into a depression, where the cave entrance lies.The cave entrance is of stooping height but once inside the passage immediately opens up into impressive proportions, of 25 m or more high and 30m wide. The cave contains some impressive calcite formations in the form of stalactites, stalagmites and a lot of flowstone, which are sadly blackened by the kerosene bamboo torches used by the local people. This prompted the British excursion (Brooks 1993b; Brooks & Smartl995) to nickname the cave as “Krem Sooty.” This cave is revered by Hindu saddhus, who come from as far as Nepal. The slope from Tongseng village leads to a sink which is free climbable and leads to a very unstable boulder blocking-, downward passage which eventually leads, to the dream of cavers, of big stream-way passages.The cave system has numerous entrances of 50 or 60 m deep potholes like Krem Myrliat, Krem Moolale, etc. 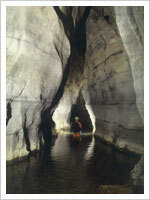 to a dendritic pattern of stream cave passage, which all resurges at Krem Ticha. 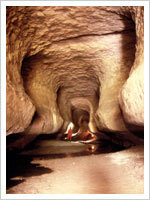 It is a magnificent river cave with equally magnificent formations that would leave one spellbound. The cave is situated on a spur protruding from the eastern flank of the Shnongrim-Tangnub Ridge into the upper reaches of the Litien valley.The impressive daylight lit pothole entrance, measuring 10 by 15 m wide and 15 m deep, leads to a wet horizontal main passage which in turn leads to a very wet but incredible maze of intricate passages interspersed by orange coloured gours. This entrance pot hole could be avoided by entering through a free climbable slot in a sheltered nook below a leaning boulder at the edge of the pot-hole entrance. 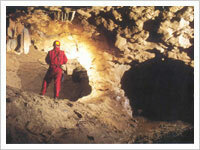 The cave hasa number of beautiful fossil passages. It is 3398m in length. 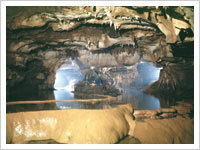 Four kilometres north of Nengkhong village, are the two adjacent 1 m diameter circular entrances of Tetengkol Balwakol which lead to 5.7 km of dendritic river cave which also contains a maze of stooping to walking size passages. For such a small entrance it is really amazing to find behind it, a large and sizeable cave. 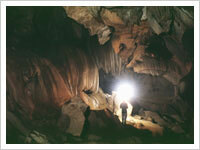 132 kms from Tura, Siju is famous for Dobakkol or the bat cave with impressive stalagmites and stalagtites. It is one of the longest cave in the Indian Sub-continent and contains some of the finest river passages to be found any where in the world. There are magnificent limestone rock formations inside, especially named princes, Di’s chamber by the excavators will fill any visitor with awe. 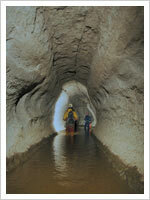 The 18m wide and 12m high entrance leads to a largish meandering stream passage. The cave houses a large population of bats. With 1352m of surveyed length, the cave is still ongoing.